Truflo Marine Limited have invested in an �Optical Emissions� material recognition device, acknowledging the importance of Positive Material Identification (PMI). This provides the Truflo Marine Quality Assurance team with the ability to quickly validate raw materials supplied by the foundry or stockist. The relatively small device can be operated by hand and gives results in just three seconds. 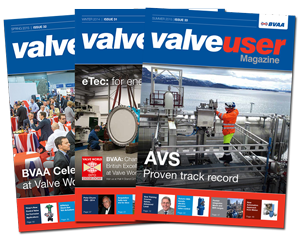 It's function is to help Truflo Marine to test that materials are of the required standard, which is of particular importance given that Truflo Marine operate primarily in the high integrity sector of the valve market. This ensures that if Truflo supply a valve for critical use, for example a submarine hull valve, that the valve is made of a sufficiently high specification material in order to withstand the significant forces it will be subjected to over several decades of use. The Optical Emissions device tells the user which materials the sample is composed of, and links directly to a printer so that the results can be scrutinised manually by a member of the team. So how does the device work? It strikes an electric 'arc' on the sample component, causing the material to burn and therefore give off a light. The machine is then able to identify the component materials by analysing this light, as different elements give off a different light intensity. Although it is not designed for material certification, it is used in conjunction with other methods of material recognition, for example a Spectrometer. The real benefit of the Optical Emissions equipment is the ability to validate a component quickly. Rob Watson, Technical Director at Truflo Marine, feels the acquisition was essential, "The Optical Emissions device is important because it enables our QA team to fully validate the supply chain. We are able to cross-reference the results provided by the device with the Material Certification, thus making sure that there are no weaknesses which may compromise the integrity of our products."